London Mayor Boris Johnson has announced that 100,000 new homes will be built on the Thames waterfront by 2020. The Thames also known as “London’s forgotten highway” is part of a new initiative to turn the river into a key mode of transport to serve London’s ever growing commuter population. One of the first areas to benefit from TfL’s plans to make more use of “London’s forgotten highway” is Plantation Wharf in Battersea. A new pier is set to open next month, which will be served by a new fleet of fuel-efficient catamarans that will operate between Putney and Blackfriars. 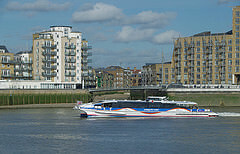 Currently, there are two main river bus routes along the central Thames - Putney to Blackfriars via Chelsea Harbour, and from the London Eye to Woolwich via Canary Wharf. The new waterfront neighbourhoods, which are soon be unveiled, will be designed to make it easier to travel to and from work using the water-based routes. The river’s profile will receive a much needed boost thanks to a number of promenades, floating restaurants, performance spaces and nature retreats.